Betty H. Fairfax High School is an IB World School offering all students an IB Education. The Diploma Program is offered to students Grades 11-12. The International Baccalaureate is an internationally recognized program of study noted for its depth, challenge, and global perspective. It is an inclusive, comprehensive, and academically rigorous two-year curriculum that focuses on fostering lifelong learning skills. IB aims to educate the "whole person"
IB encourages students to appreciate cultures and attitudes other than their own and to be informed and willing to communicate with others. 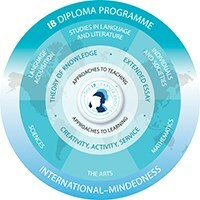 The IB approach to education is not encyclopedic. The emphasis is on helping students analyze their education and use it in meaningful, practical ways. The IB DP's international acceptability allows for both flexibility and mobility.